Associazione Radioamatori Italiani – Sezione di Mestre – "Enrico De Rossi I3DRE"
- VERDE = "Attività di Sezione"
Thomas, F4HPX will be active as FR/F4HPX, from Reunion Island, IOTA AF - 016, starting Mid May 2019. 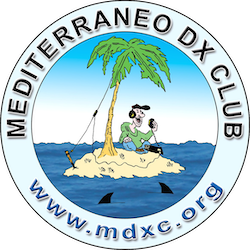 J20DX Team will be active as J20DX from Moucha Island, IOTA AF - 053 and Seven Brothers Islands, IOTA AF - 059, Djibouti, 14 - 20 April 2019. A82X and A82Z will be active from Liberia, 28 September - 11 October 2019, by members of Italian DX Pedition Team. Bernhard, DL2GAC will be again active as H44MS, from Malaita Island, IOTA OC - 047, Solomon Islands, 5 July - 25 September 2019. 6W1RY Team will be active from Senegal in CQ WW DX SSB Contest, 26 - 27 October 2019. VU7RI Team will be active from Lakshadweep Islands, IOTA AS - 011, 19 October - 3 November 2019. KL7RRC/P Team planning to be active from Sledge Island, IOTA NA - 210, Alaska, in August - September 2019. T40A Team will be active from Cuba in CQ WW WPX CW Contest, 25 - 26 May 2019. Saturo, JI1DFO will be active as FS/AG5CR from Saint Martin, IOTA NA - 105, 16 - 18 June 2019. David Palma, CT1EKU will be active as D44CH, from Sal Island, IOTA AF - 086, Cape Verde, Cabo Verde, 14 - 19 April 2019. AGO Varese 2019, un ottimo risultato per un nuovo corso in A.R.I. ARI Mestre utilizza i cookie unicamente per migliorare la tua esperienza di navigazione. Non usiamo i cookie per scopi di profilazione o di marketing.